Non fiction – paperback; Penguin; 240 pages; 2005. 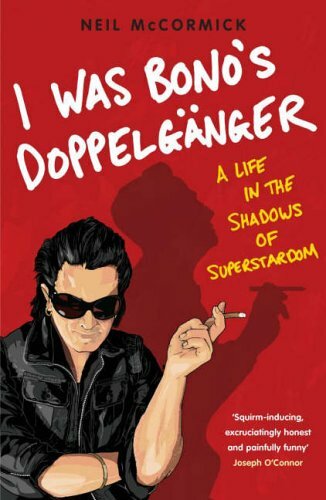 I was Bono’s Doppelgänger is about one man’s struggle to achieve his ambition of being a rock star. The only problem was his school friend, Paul Hewson, beat him to it. Paul Hewson, is, of course, Bono of U2 fame. Neil McCormick takes the reader on a wild ride from his Dublin school days in the 1970s at probably the most famous primary school in the world, Mount Temple, to the dizzy heights as a music journalist for London’s daily broadsheet The Daily Telegraph in the late 1990s. But being a successful writer wasn’t what McCormick had planned. He wanted to be famous for a completely different reason: pop music. The book charts his attempts to make it in the music industry, falling (depressingly and frustratingly) at almost every turn, while Bono and the lads, otherwise known as U2, take the world by storm, performing record-breaking stadium concerts, selling millions of albums and becoming the most famous people on the planet. U2’s meteoric rise only seems to put McCormick’s so-called failures into deeper shadow. As much as loved reading this hilarious and heartbreaking story, most of the time I wished I could shake McCormick by the scruff of the neck and shout WAKE UP, IT AIN’T EVER GONNA HAPPEN! If nothing else, this book is testament to perseverance, of never giving up, of striving and striving against all odds to live a dream. Unsurprisingly, the writing is candid to the point of being embarrassing. Pain, frustration and repressed anger resonate off the page. McCormick’s envy and resentment of U2’s success is palpable. “You’re living my life!” he once raged at Bono. But the overall tone of the book is balanced nicely by the use of wince-inducing one-liners, funny anecdotes and layer upon layer of self-deprecating humour. Without this, I was Bono’s Doppelganger may have come off as sounding like a jealous rant. Instead it paints an engaging portrait of Bono as a genuinely good-hearted man, not the egotistical preacher-like celebrity he sometimes comes across as (I’m allowed to say that because, just in case you didn’t know, I’m a bit of a U2 fan). Alas, the only ego in this book is McCormick’s and even then you can’t help but be charmed by him as well. Overall, this is a brilliant, funny, honest and ironic book. I couldn’t recommend it highly enough. I don’t listen to U2 – but I’ve been told the a group that I do, Delirious?, sounds like them. This book is very funny and leaves you feeling better about life. What more can you ask? This book sounds great! I also just watched the movie inspired by this novel, and it just wants to make me read the book even more. What a story!